Say hello to the Jade Roller – an age-old beauty tool that has been around for centuries, but has only recently come back in vogue. The Chinese believe Jade to be an imperial gem and it is the equivalent to Diamonds (for westerners) if not more precious! The Jade Roller, as the name suggests, is made from the Jade Stone, which is known for it’s healing properties. It is believed that Jade helps to calm anxiety and lessen fatigue. Not just that, it will also help balance your chi and protect you from negative energy. But, if you’re someone who is purely interested in its physical benefits, then read on, because this wonderful beauty tool has a lot to offer! Not sure what Lymphatic Drainage means or why it’s important? Well, to put it in the simplest terms – it is flushing out toxins from the skin and it is important because that is what leads to healthier, glowing skin. We have several lymph nodes on our face and along our neck and if this lymph node system becomes sluggish for any reason, then it can cause dullness as well as cystic acne (especially around the jawline, chin and mouth). Today, I want to touch upon How To Use a Jade Roller Correctly… so let’s jump right in. Now, there are a lot of theories and people tend to use jade rollers in different ways, but I’m sharing MY METHOD with you and I’ll also explain why I choose this particular technique. The Numbers 1,2,3… – these depict where you start and the order you follow while rolling. The Direction of the arrows – this is the direction you will always move the roller. The Black Dots on the left side along the ear, jaw and down the neck – these are where the lymph nodes are situated. The 1st Rule is – Always start at the neck! This is because we want to channel the toxins out of the body. When using on the face, always move the roller in upwards and outwards direction. This will help to uplift the skin and give you that tightening effect. The 3rd Rule – Go Slow and Gentle! Jade rolling is about pampering your skin, so please don’t rush through it. Make it a morning and/or an evening ritual…something you enjoy doing and you will see results. Also, be gentle with the roller – you really don’t need to put any pressure while rolling on your skin as the rolling mechanism does all the work for you. Only go in one direction. I see so many people on Instagram rolling back and forth on their skin and that could lead to a lot of tugging and pulling of the skin, so please bear in mind to always roll in the same direction – never back and forth! Start by rolling down the neck to open the channel for lymphatic drainage. Gently place the big roller head right under your ear and roll down 5-10 times. Work in sections and make your way through to the other side. Once you’ve completed the downwards motions on the neck, start by rolling from the centre of the neck towards your ears – sideways and upwards direction. You are now lifting the skin up. Step 3 is where you start rolling in upwards and outwards direction because now the lymph nodes are beside your ear and along your jawline. Start from the centre of the chin and roll upwards towards the ear. Smooth, gentle rolling motions and repeat each section 5-10 times. When you come to the mouth area, you can purse your lips and roll over them. Again roll upwards and outwards towards the ear. 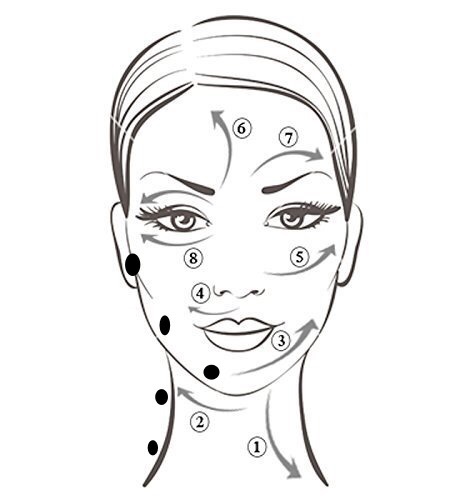 Step 5 is your cheeks – again follow the same rule, up and out towards the ear. Work from the nose, out to the ears. You can also roll upwards starting at the jaw and push your roller till you hit your cheekbone – GENTLY. This will give you that chiselled cheekbones. Start from the centre of the forehead, where the eyebrows meet and roll upwards, over your third eye area and towards your hairline. Repeat 5-10 times for each section till you cover the entire forehead. Next, roll sideways and towards the ear to flush toxins towards the lymph nodes by the ears and roll down the sides of the jaw all the way to the base of your neck – one sweeping motion. Repeat this movement 3-5 times. Using the small roller, roll very gently from the inner corner of the eye towards the ear. Be very gentle around your eyes, because this area is very sensitive. You can also use the small roller and do gentle upwards motion under the eye and then roll towards the ear. And that is how you use a jade roller correctly! Beautifully explained Ankita!! This step by step tutorial will make it easy for beginners. Thank you so much for your love and support...it means the world! Interesting product, good to go through the necessary details.